Legian Beach Hotel is styled in the traditional Balinese style with a warm, welcoming atmosphere that provides an authentic Bali holiday experience. This beachfront resort is situated overlooking Legian Beach and is just minutes from the shopping, restaurants and nightlife of Kuta. 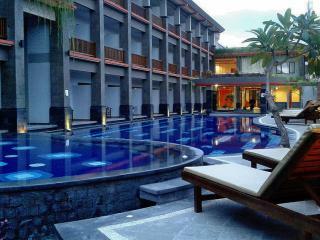 Accommodation at Legian Beach Hotel is as diverse as the island itself, catering for every type of traveller and budget. The thatched roof bungalows and hotel rooms are spacious and well-appointed with elegant décor and stunning tropical garden surrounds. The facilities at Legian Beach Hotel are second to none and include 2 swimming pools, each with an adjoining kids pool and both of which are adjacent to the beach and the tropical landscape of swaying palms and exotic flowers. There is also a kids club, swim up pool bar, day spa, beauty salon, restaurants and nightly entertainment. The thatched-roof Balinese style bungalows and hotel rooms at Legian Beach Hotel are all generously sized and set amongst 4 hectares of lush green gardens. Deluxe Room: Located in the main building and overlooks the tropical gardens from the living and balcony area. Size is 45m². Bedding is 1 Queen Bed or 2 Single Beds. Maximum room capacity is 3 Adults & Children. Deluxe Garden Bungalow: Located in the mid section of the hotel, between the main building and the deluxe beach bungalows, most have a garden view and each boasts a private terrace. Each bungalow has 3 individual rooms with private facilities, which can be booked seperately or can be combined to become 3 interconnecting rooms under the one roof. Size is 43.16m². Bedding is 1 King Bed OR 2 Single Beds. Maximum room capacity is 3 Adults & Children. Deluxe Beach Bungalow: Most are located on the beachfront, some with a view of the beach and others with a view of the garden or the pool. Each boasts a private terrace overlooking the beachfront or gardens.Each bungalow has 3 individual rooms with private facilities, which can be booked seperately or can be combined to become 3 interconnecting rooms under the one roof. Size is 50.75m². Bedding is 1 King Bed OR 2 Single Beds. Maximum room capacity is 4 Adults & Children. Superior Family Room: Located on the ground floor of the main building, close to the entrance of the hotel. Comprised of a large room divided by a wall partition to create 2 interconnecting rooms linked by a sliding door. Size is 58.53m². Bedding is 1 King Bed + 2 Single Beds. Maximum room capacity is 4 Adults & Children. Deluxe Family Room: Features a split level design with a loft room on the upper level and another room on the lower level. Most of the Deluxe Family Rooms are situated on the upper floor of the main building, close to the entrance of the hotel. Bedding is 1 King Bed + 2 Single Beds. Maximum room capacity is 6 Adults & Children. Deluxe Pool Villa: Located in the mid-section of the hotel between the garden and beach bungalows. Each Deluxe Pool Villa has its own unique layout and a private swimming pool, as well as an outdoor shower and a small private garden area. The Deluxe Pool Villas are enclosed by a wall surrounding the villas to ensure privacy. Size is 112.50m². Bedding is 1 King Bed OR 2 Single Beds. Maximum room capacity is 2 Adults & Children. * Please note, this room type is suited to maximum 2 guests, however an extra bed can be placed in the room on request (space limited). Bale Banjar Restaurant: Offering sumptuous European, Indonesian and Oriental cuisine as well as special barbeques and buffet dinners, this open air restaurant enjoys a relaxed atmosphere accompanied by cultural shows presented regularly on the adjacent open stage. Lais Restaurant: Taking your tastebuds on a journey through the Indonesian islands, this restaurant offers local delicacies, traditional cuisine and tempting desserts. Cooking classes are also available to discover the secrets of the flavours, ingredients and aromatic herbs and spices of Indonesian cuisine. Ole Ocean View Patio: The perfect place to relax by the pool and enjoy the breathtaking views of the beach and the Indian Ocean. With 36 cosy sun loungers shaded by umbrellas time will fly as you enjoy waiter service and house, R&B and lounge club music in this stylish hangout. Gino's Pasta & Pizza Corner: Open from 12 noon to 4 pm, this alfresco restaurant offers excellent views of the beach accompanied by the mouth watering flavours of the Mediterranean with some of the best Italian in town. 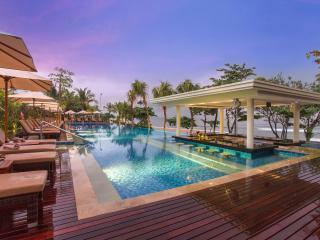 Ocean Terrace Restaurant: Here you can enjoy a variety of Asian & International cuisines. There is live entertainment on a daily basis plus an oriental buffet dinner with a cultural show once a week. Yuyake Teppanyaki Restaurant: Offering stunning views of the ocean and Legian Beach, here you can just relax and enjoy a romantic dining experience. Ole Beach Bar: A great place to come to when you just want to relax, offers views of the ocean, Legian Beach plus the tropical gardens. Enjoy an array of beverages and finger food. There are even reading books available so take your pick and get comfortable! Siku Bar: Enjoy the stunning views from this relaxed bar, choose from an extensive drinks menu including creative cocktails. Usadha Spa: Set in gorgeous private garden pavilions, this spa menu offers a variety of treatments to relax and pamper combining contemporary and traditional techniques. Each treatment is complete with the finest massage oils and blended elixirs of natural ingredients and essential oils for a truly unforgettable experience. Little Starfish: The kids club at Legian Beach Hotel offers a fantastic range of games & activities for kids 3-11 years to enjoy. Expensive but in a great area. Rooms rates have risen and are now quite expensive but the position of the Hotel is excellent. 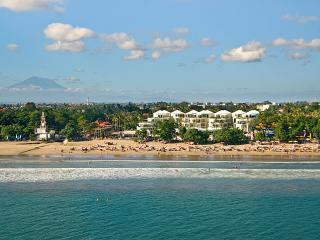 We really enjoyed our stay at the Legian Beach Hotel. The breakfast was awesome and we loved both pools, especially the swim up bar. We also loved the ocean view patio, great to sit around and relax with a few drinks watching the sunset while the kids swam in the pool. I thoroughly enjoyed my stay at the LBH. The staff were very friendly, hospitable and attentive. Location was great and the food at their restaurants were delicious. Will definitely stay here again.